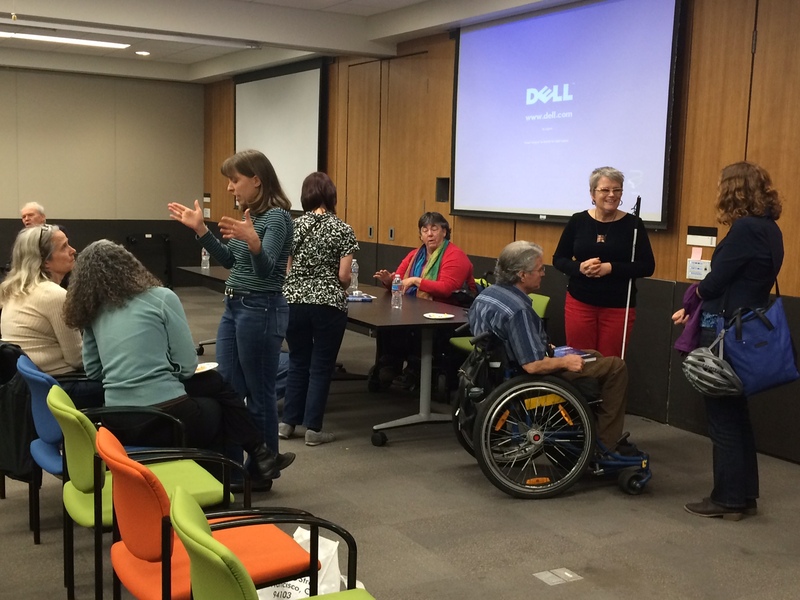 Our second public event to celebrate the launch of Paul K. Longmore's Telethons: Spectacle, Disability, and the Business of Charity held at the Ed Roberts Campus brought out Paul's friends, colleagues, and fellow disability activists. We gained insight and antidotes from Paul's closest friends but also discussed some of the bigger issues and inspiration behind Telethons. The evening began with a warning: incoming clips from 1970-80s telethons may make you throw up. As a montage of music performances, glittering 'grand total' signboards, and cute disabled children rolled across the screen, many attendees were reminded of what it was like to really watch a telethon. As Longmore Institute director and Telethons editor Catherine Kudlick explained, "Telethons taught Americans how to think about disability and the body...and that was bad." Telethons brought disability into American prime-time, framed as a primarily monetary quest for a 'cure.' 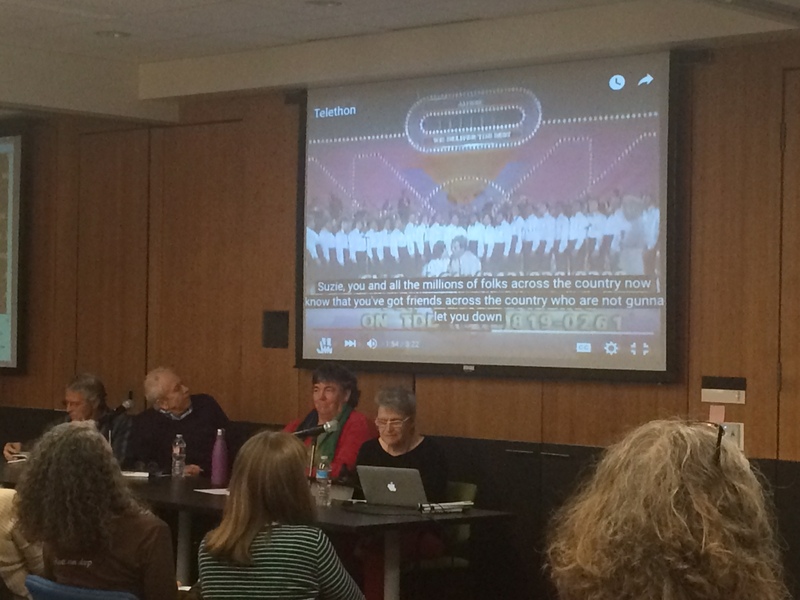 Panelists and attendees relive classic 1970s-80s telethons. "The reason we're doing this is 'you must walk'" recalled panelist Corbett O'Toole. Like Paul himself, disability activist O'Toole was affected by childhood polio. She herself was paraded as a local poster-child and remembers thinking that all of the children that appeared on screen would eventually be 'cured.' For O'Toole, telethons were a part of the pressure she experienced throughout childhood to learn to walk, pushing her beyond physical limits, which resulted in increased wheelchair use later in life. For other viewers, telethons were a parade of sickly children. One attendee recalled running into kids she'd known growing up who asked her why she wasn't dead yet - an assumption they'd derived from watching the telethons. Personal stories such as these illustrate why Longmore's efforts to capture this history is so significant. Panelist Ralf Hotchkiss called Telethons a book of stories. Readings from his favorite excerpts, many of which came from the footnotes, he touched on Paul's personal life and friendships. As panelist Anthony Tussler explained, "Paul documented something that's part of the disability rights movement that would have been lost." Paul's voice as a scholar-activist shines through. Telethons is a systemic critique of how this social phenomenon affected both disabled and non-disabled people. Kudlick refers to the book as a "call to action" that "lays down the foundations for thinking about the future of people with disabilities." While the content of the book is groundbreaking, the dialogue it can spark in one evening discussion is just the beginning of Telethons' true impact. The discussion continues as attendees mingle.